I've tested over 15 FT-1000 and 1000D's with this mod. This modification will reduce close-spaced strong signal dynamic range in every FT1000 or 1000D by a substantial amount! The IM problem is created because the FT1000 heavily forward-biases the noise-blanker's first FET whenever the blanker is turned OFF. This causes the FET hanging on the IF system to have high gain. Strong signals within roofing filter BW saturate the FET's drain, causing mixing products (IM). These new signals feed directly back into the 8MHz IF section, creating interference to any desired weak signals. The FET's IM creates new "phantom" signals that sound like normal CW signals. On SSB, it creates IM that sounds exactly like splatter! 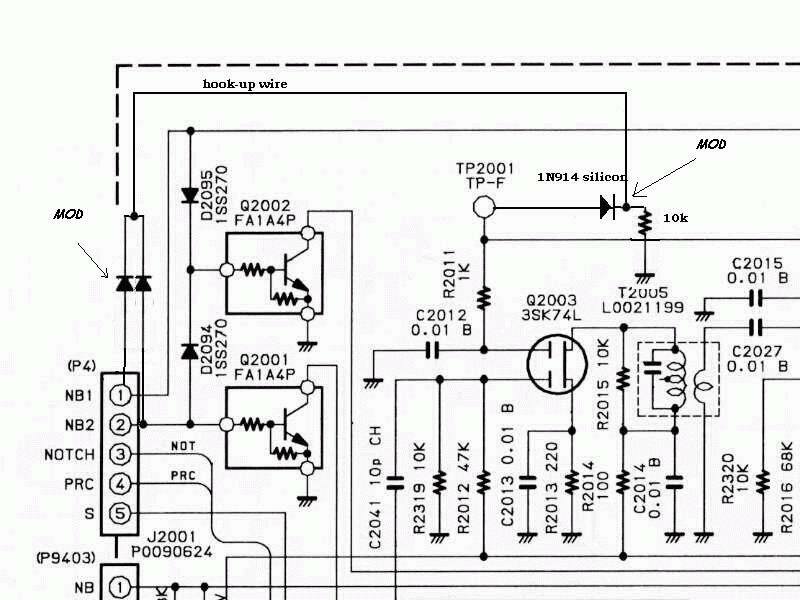 Note: The cause is the same as in the FT-1000MP MK V. You can see a schematic and explanation of the problem on the FT-1000MKV page. This modification removes harmful forward FET bias that is applied even when the noise blanker is off. 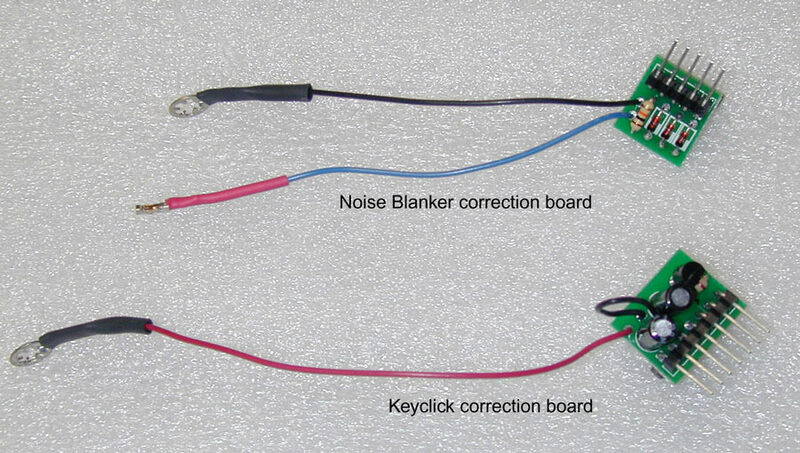 This mod prevents the noise-blanker from creating interference to weak signals when the blanker is turned off. The NB functions normally when on. This mod greatly improves strong signal IMD in the FT-1000. I used a 2 kHz test spacing in the measurements, so the 12 kHz wide 70 MHz first IF filter did not make results look artificially better. I ran two HP generators through a combiner into the front end, and measured IMD with a selective level meter with 50 Hz BW and also with the 1000's internal meter (which is about 2 dB per S unit below S6, not six dB as claimed). This was the primary source of IMD in my brand new FT-1000, and the difference was dramatic. Remember this is a sample of one unit. I carefully looked but I never found anything wrong other than the fact the receiver forward biases the first FET in the noise blanker fully-on when the blanker was shut off, and that IMD feeds directly back into the 8 MHz IF stages. The result was a few volts of peak RF voltage on the FET drain, and considerable amounts of that voltage feeding back to the IF stage through stray coupling. I am working on better mods to the front end, but this is a substantial change. Be sure to use common sense and turn off power when soldering, etc. 1.) Remove the bottom cover. 2.) locate the noise blanker on the left rear corner of the IF board near the first group of 8 MHz filters. 3.) Locate TP -2001. 4.) Connect a small silicon switching diode (1N4148 is one example, although other silicon-type signal or switching diodes will work) through a 10k ohm resistor to ground from TP-2001. The diode cathode (banded end) goes towards the resistor and ground, anode towards TP-2001. Caution: DO NOT use a high leakage germanium diodes. Use low-current silicon switching or detector diodes. 5.) Construct a pair of diodes with the cathode (banded end) tied together. Leave the leads long for now. 6.) Connect one of this diode pair's anode to pin 1 (the brown wire) of J2001. 7.) Connect the other diode anode to pin 2 of J2001. 8.) Connect the common-cathode of these two diodes to the junction of the 10K resistor and the cathode of the diode installed in step 4. Note: I just pushed the wires down in the pin of the plug (P2001) and tacked them in place with a tiny bit of solder. You can verify these are the correct pins by measuring the voltage when switching the NB and wide NB buttons. Turning either or both NB switches "on" applies about 8 volts to either or both pins. Connect the common to the diode cathode and 10k resistor junction through a short hook-up wire. 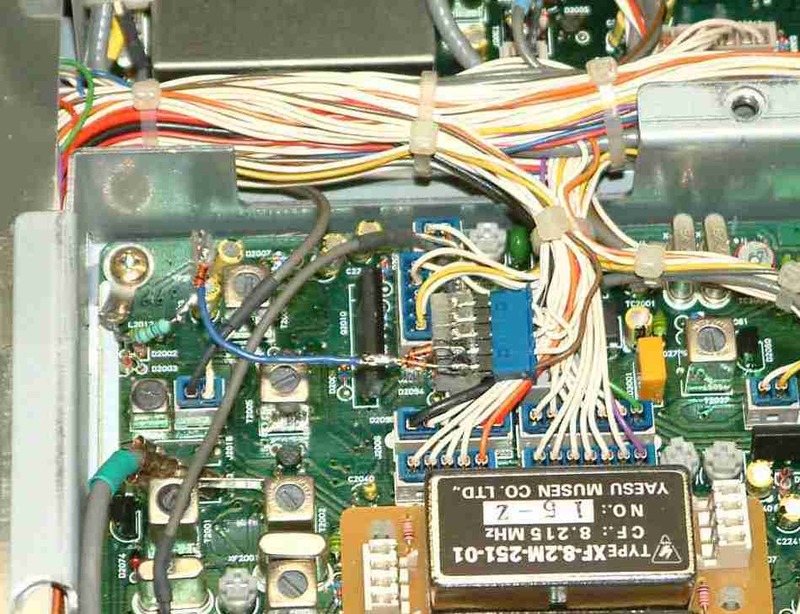 This mod removes forward AGC bias from Q2003 and 2004 when the noise blanker is off, and prevents IM distortion fed back via C2041 and foil traces from impacting the receiver when the noise blanker is off. Other than improving IM performance when the blanker is off, it has no effect on NB performance.